Modern Beauty Girl: Hair Inspiration! So I was a little strapped on time so I didn't get to do a tutorial like I wanted to today, but I thought that it was time for another inspiration post! So I have my hair one for you today and my makeup one will go up tomorrow! Here we go! I love this! I swear that Lauren Conrad is always so put together with her makeup, hair, and outfit and this is no exception! I really love this hair because it is really put together and nice, but doesn't look fussy or over the top. I also like her part in this because it's a little zig zag and I think that is so cool! I love Diana Agron's hair! If my hair was thin and straight, then I would totally cut my hair like this because it is so edgy and amazing! But my hair is thick and wavy, so it would look kind of poofy and crazy if I did this! 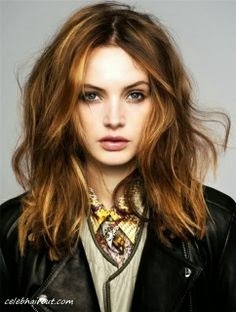 I am actually thinking of cutting my hair like this into choppy medium length layers. I really like the messy look with this and since I have wavy hair to start with, I think that the haircut would match my texture! So that was my hair inspiration! I might be a little off with my posts this week because it is my last week before spring break so I have tests and papers and all that jazz, but I will get some quality content up next week! yeah I love Lauren too! I feel like she is so put together all the time!